Hi folks, this is my most recent build. 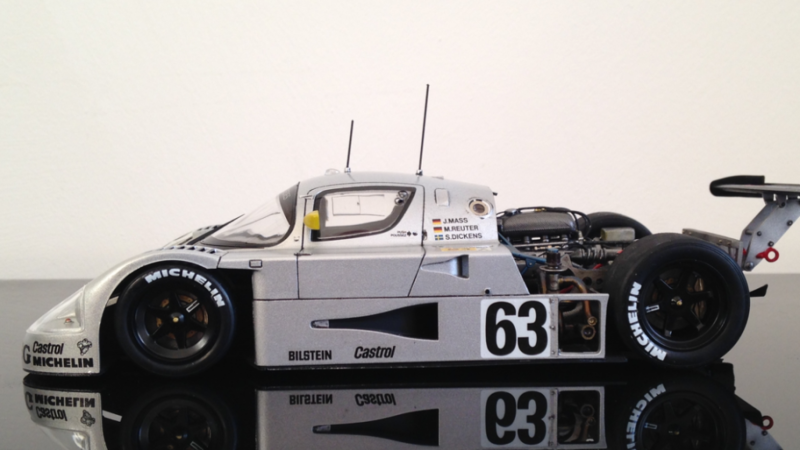 It’s an old Tamiya 1/24 kit of the 1989 Le Mans winning group C car. 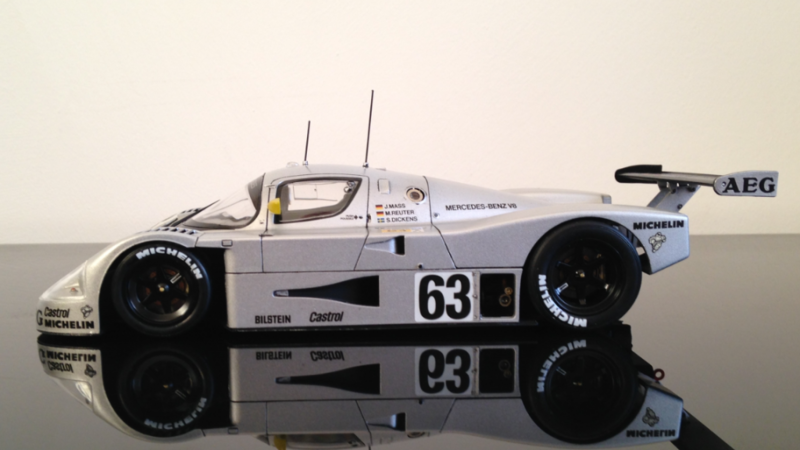 The car was a continuation of the partnership between Peter Sauber as a constructor and Mercedes as the engine builder. 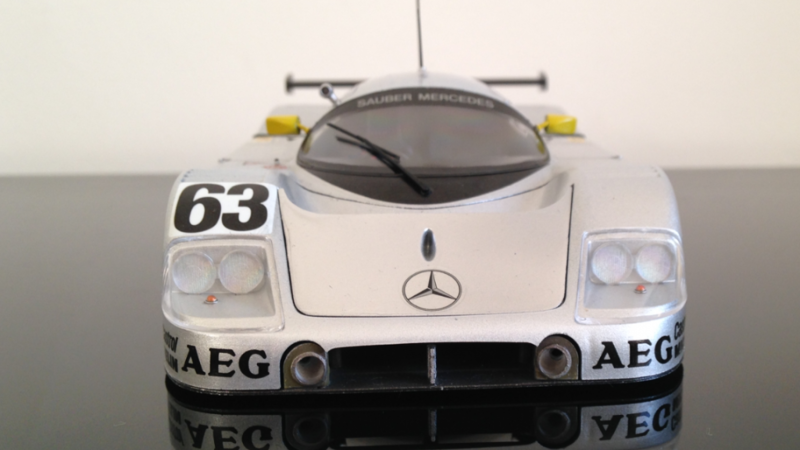 The number #63 car took the win with the #61 Sauber Merc coming in second, and the #62 car taking a respectable fifth place. 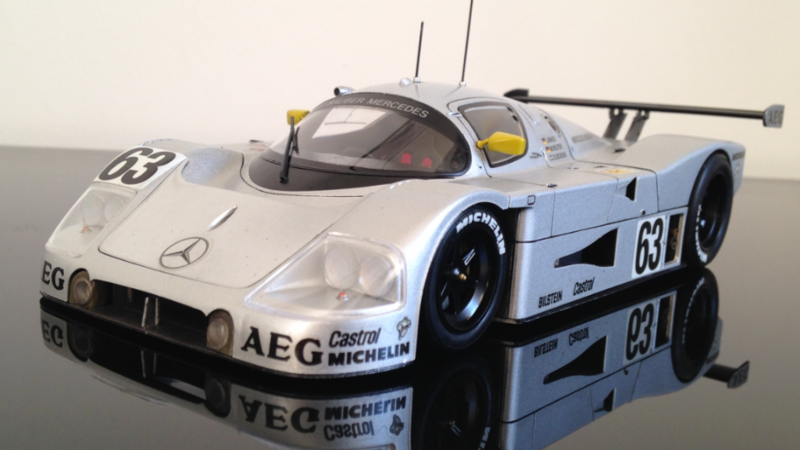 The 1989 cars were nicknamed the “Silver Arrows” due to their relatively simple but striking ( and now iconic ) liveries. 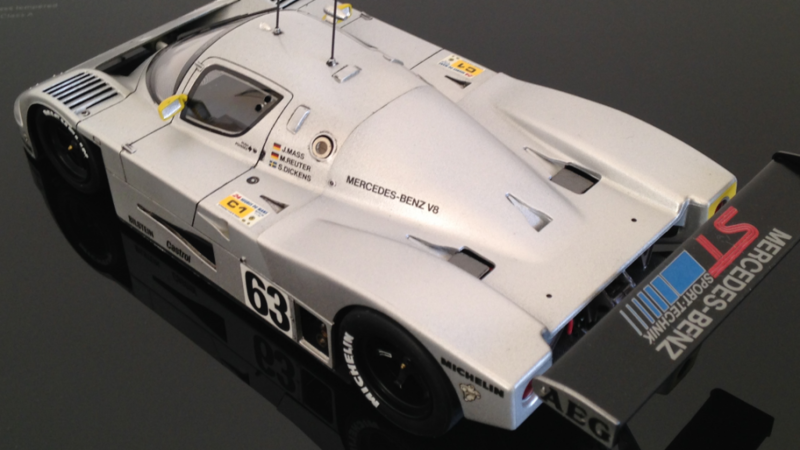 The engine featured in the C9 was the Mercedes M119 5.0l twin turbo V8. 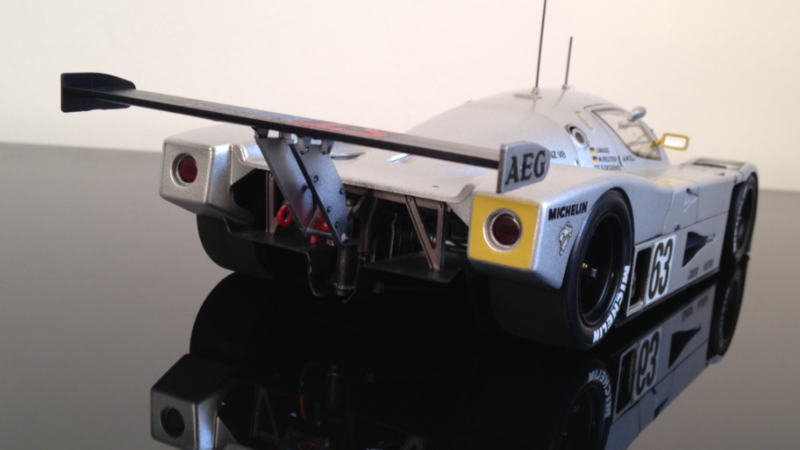 It was capable of 720 bhp but was limited to 650 bhp to conserve fuel for the 24 hour endurance race. 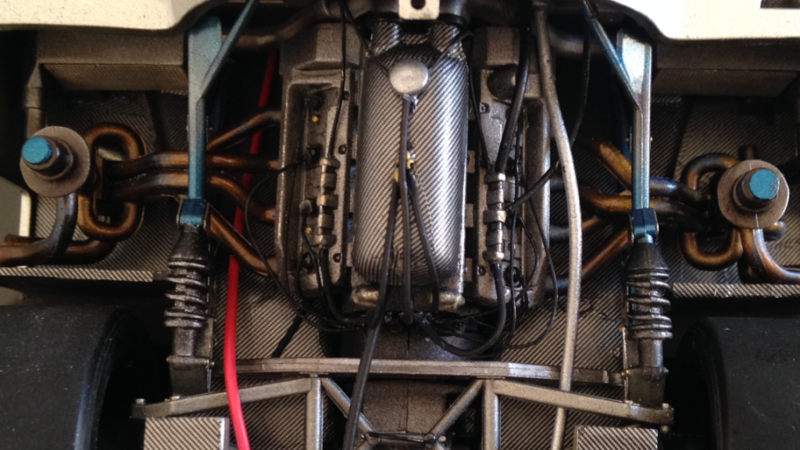 The car itself complete with the engine weighed in at only 905kg. 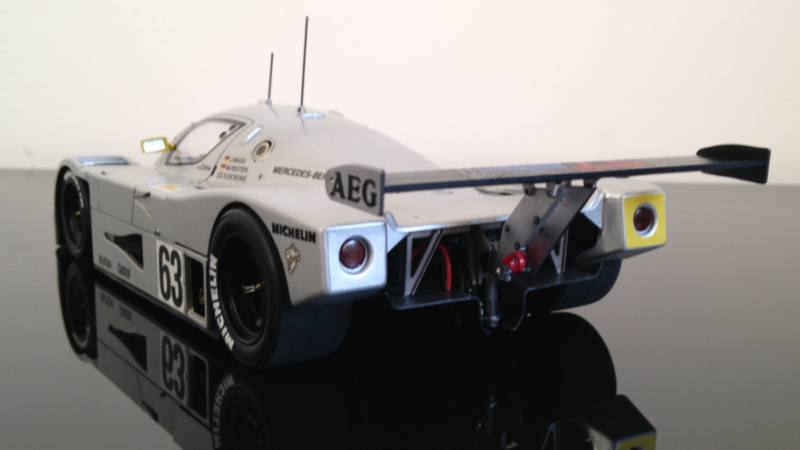 It was clocked at 247mph on the Mulsanne straight! The car actually has a special place in my heart as it was my favourite group C prototype on Playstation’s Gran Turismo. I must have done thousands of virtual laps in the #63 car over the years. I snapped up this kit on E bay for a really good price. The bundle included a Scale Motorsport photo etch set, a couple of sheets of carbon fibre decal and the windscreen masks. I painted it using a mixture of Tamiya Acrylics and Alclad 2. I did a work in progress build on this one over in the automotive group category for anyone wanting to know more about the build and painting stages. The kit itself was good fun to build. 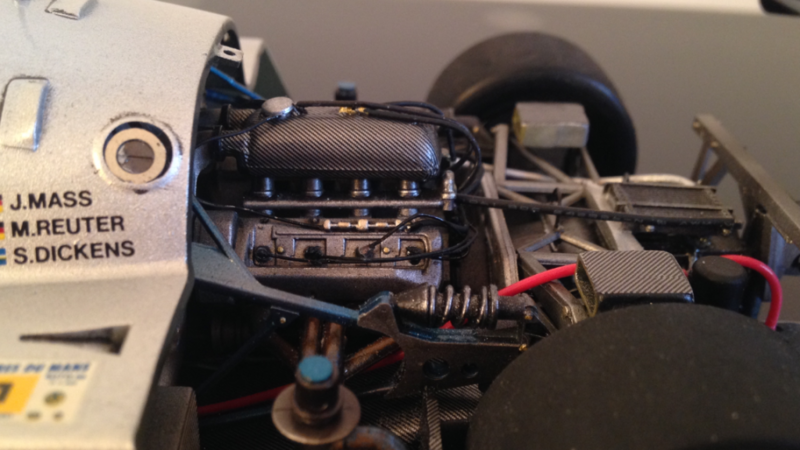 It wasn’t as easy to put together as a modern Tamiya kit, but it is still a Tamiya, so no major complaints, just some parts needed a little adjustment or gentle persuasion when assembling! Thanks very much for looking, and a big thank you to those who followed the work in progress. Nicely done, Richard…the photos on the reflective surface is a nice touch as well. Thanks Craig. I just gave the old TV stand a good polish! Cheers mate. Very nice Richard, a lot of extra detail has payed off mate. She looks a dream, great pics to. Thank you very much Simon, much appreciated! Cheers for following the work in progress mate. I like how the WIP’s always turn into a heavy metal forum also! Richard, Looks fast just sitting there. Really nice buld. Thanks Terry, they were a very fast car in reality! Beautifully finished, Richard, I knew it would turn out well, and it certainly has, and that reflective base really sets it off very well. 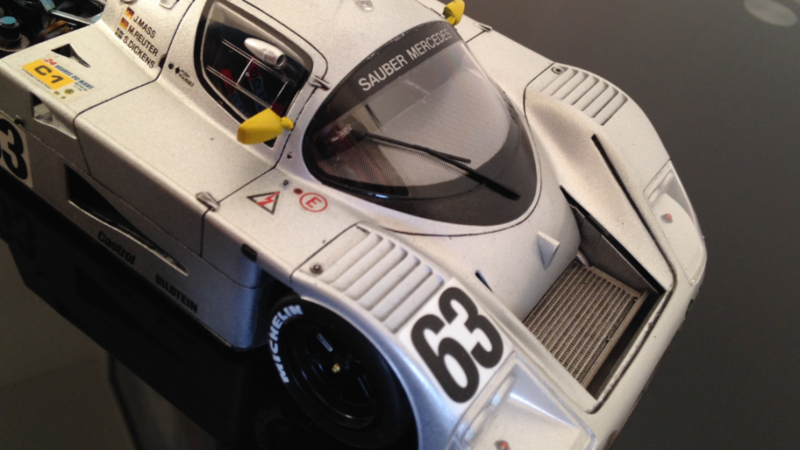 I still think a group build using the Le Mans 24 hour race as the theme would work……. Cheers George. Thanks for following the WIP as well. I’d be up for one definitely, I do think it’s more of a specialised interest for a modelling subject though. Still there would be a few of us taking part. 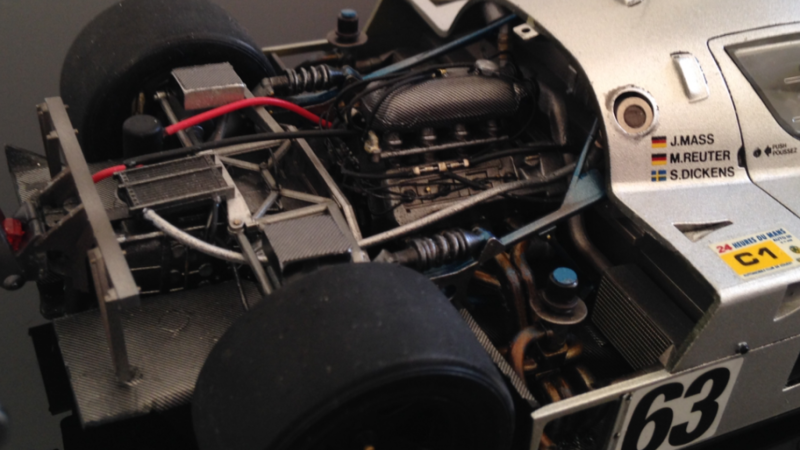 I’ve got an old Tamiya kit of a Nissan R90v in the stash with good potential to detail out the engine bay as well. I’ve actually put quite few car kits in the cupboard in recent months. Wowie Zowie Richard that is a fine looking model! One of my favorites of all time. Really well done. Thank you Steve, they are legendary machines. 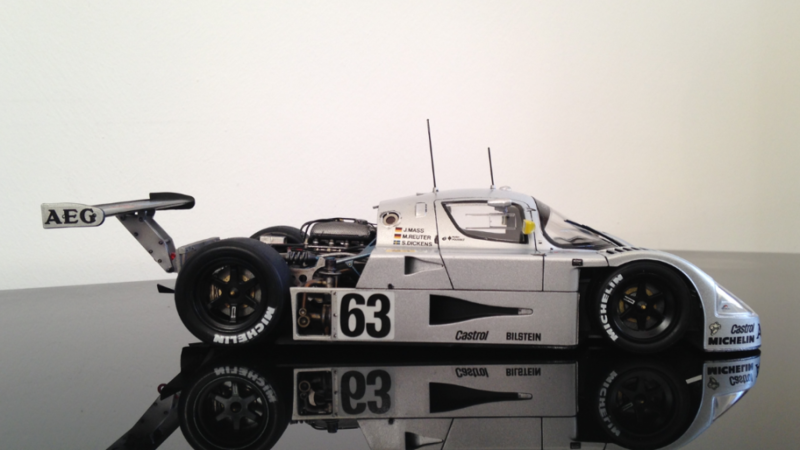 I still think the group C cars of that era are a great subject. Thanks for the compliments. Much appreciated Jack, thanks very much! She’s a beaut !! Love the Michelin tires. Cheers Phil. I see you used to work for Michelin! It was more their restaurant guide that I dealt with personally during my younger years, I always used Bridgestones on the Yamaha’s. 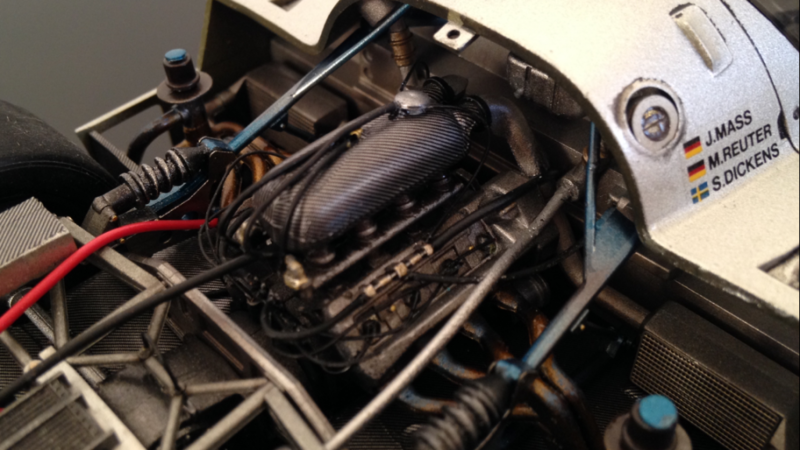 I can see the very nice engine detail, the carbon fiber airbox looks realistic. Thank you very much Wayne, much appreciated. I like it, it stands alone in a very positive way, clean and sharp. The extra detail work really makes the model different. Well done. Thanks very much! 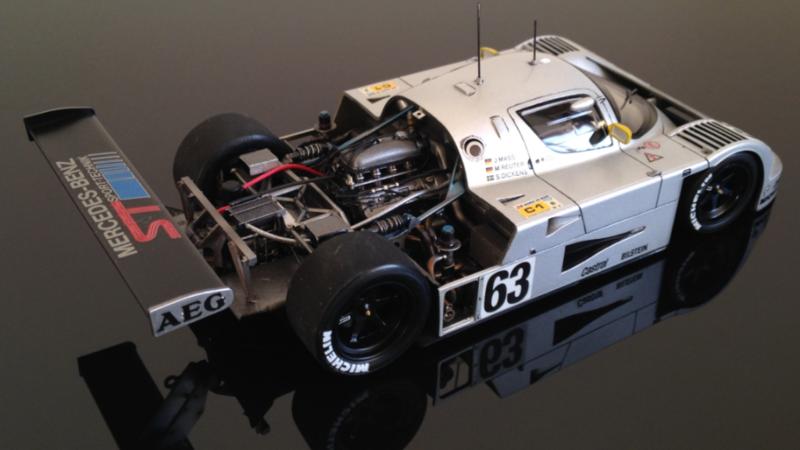 The old Tamiya kits of the group C cars have plenty of room for extra detail. Cheers. Richard, a striking model, and beautifully photographed. Well done. Thanks very much Rob! All taken with an iphone on a tv stand! Cheers. 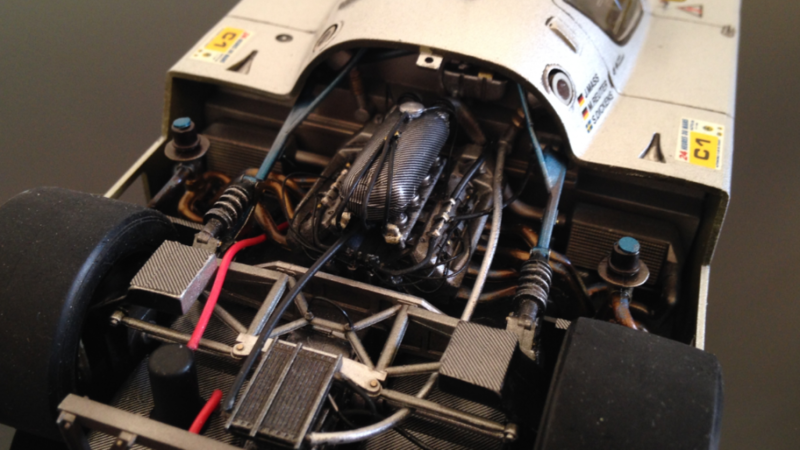 Very nice detail work Richard, I have the Tamiya 1/12 FW/14B and MP4/6 that I am itching to make, I think the car kits out there are amazing and yours is no exception. Thanks Danny, much appreciated. I have a few more car kits in the stash. I have a couple of Ferrari kits by Tamiya, they look really good. Another fine build, from out of your command centre, Richard. Flawless and perfect looking, the presentation on this shiny surface is really striking. 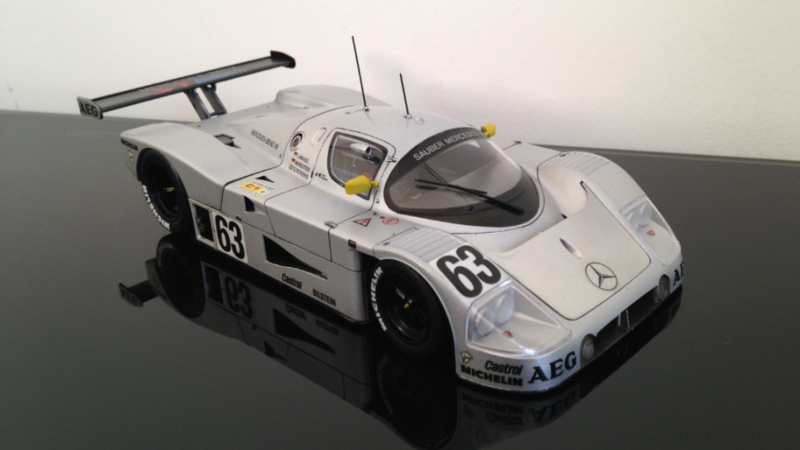 The first Silver Arrows or in german Silberpfeile, were racers build by Mercedes and Auto Union in the late 1930s. Cheers mate, thanks very much. So the Silver arrows go way back? I didn’t realise that. Everyday is a school day! Thanks very much Mike, glad you like it! Cheers. It’s a really cool circuit the Laguna Seca, I’ve never been in real life but I’ve done many a lap on the Playstation! The corkscrew section is tricky to get right. Darn it, sorry for the long arduous link! Beautiful, Richard! Great job all around. I’d be game for a Le Mans 24 Hr. group build-just need to find a good kit. Cheers Bryan, thanks. There are loads on Ebay at the minute! 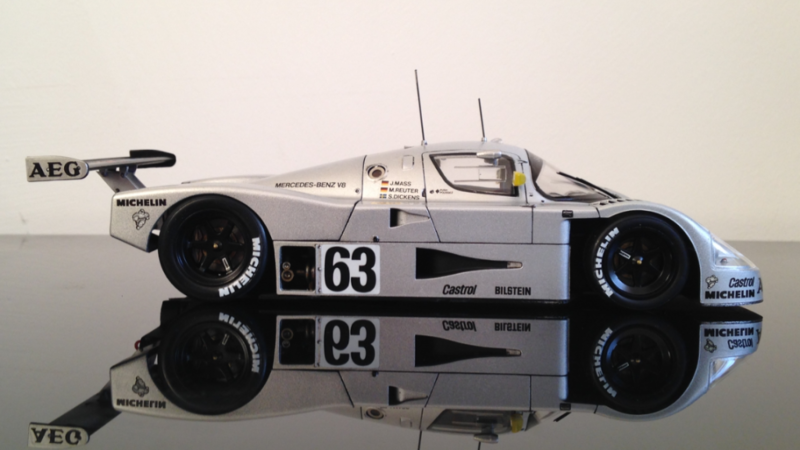 Just a beautiful build – love the detail, and really liked the reflective photography! Excellent way to photograph autos! Thanks very much Greg, much appreciated. I find a reflective surface gives them more of a showroom appearance. I still prefer using the big light box for armour and aircraft though. Damned nice car Richard! It looks fast standing still, and you’ve done a great job on it. Cheers Gary, thanks very much! 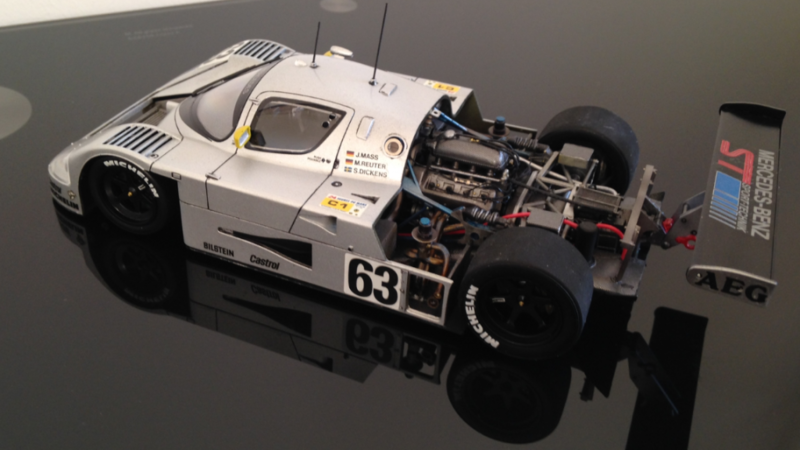 These old Tamiya kit are really exfellent for these LeMans cars ! Thanks very much! 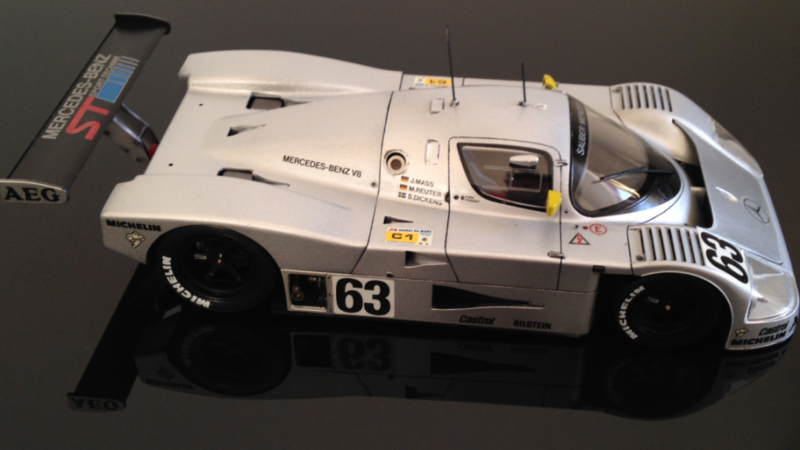 I’ve got a Nissan R89C in the stash as well but I have no idea when that one will get done!